Ever been to a city where the old and the new co-exist happily, one enriching the other? A cosmopolis, where technology, religion, heritage, and culture all come together, like in a potpourri? That’s Bangalore, the Silicon Valley of India. While you are in the city, don’t limit your sightseeing trips to its iconic parks, lakes and shopping streets. There’s another set of edifices waiting to be explored in the Garden City – its churches! 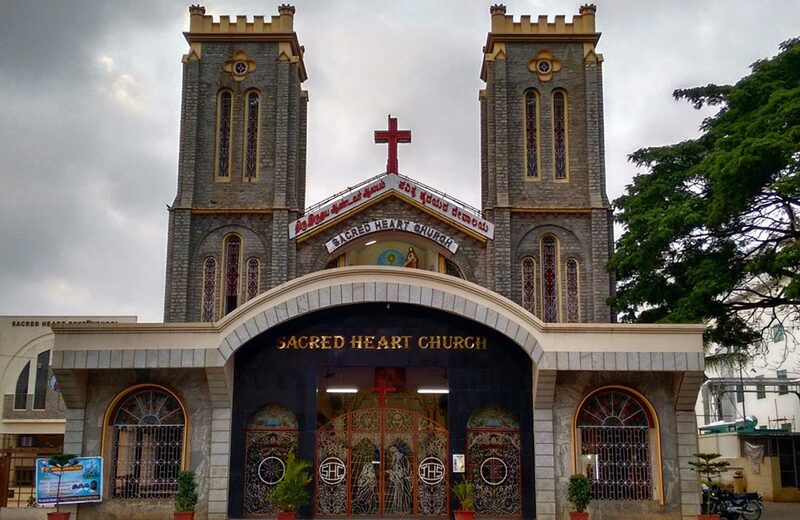 Whether you are looking for Catholic, Protestant, Anglican, Methodist or Pentecostal churches in Bangalore, you are likely to find plenty of those here. Some of these churches, however, stand out from the rest and for the right reasons. Magnificent and monumental, these are enchanting sagas of architectural exquisiteness and grandeur. A visit to the famous churches in Bangalore is like taking a joy ride in history’s ever-rolling wagon. Now, isn’t this an interesting way of discovering Bangalore in a completely new light?! Here is a guide to the majestic churches that are a must visit on your next trip to the city. With a history of more than 200 years, St. Mark’s Cathedral stands as one of the oldest churches in Bangalore. It draws its name from Saint Mark aka Mark the Evangelist, who is considered to be one of the four authors of Gospels. Found in 1808, the church was consecrated in 1816 by the Bishop of Calcutta. 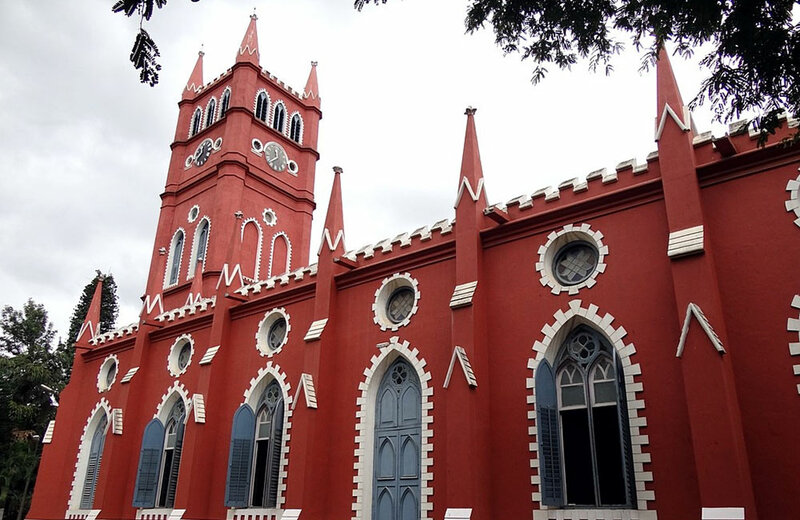 An interesting trivia about this cathedral is that it began as a garrison church for the Madras Army officials serving under the East India Company. Built in an arresting colonial style, the church is modeled after the 17th century St. Paul’s Cathedral in London. Elaborate woodwork and intricate carvings define the entrance of this edifice. Located amidst a compound dotted with gulmohar, umbrella trees, cassias, and temple lilies, St. Mark’s Cathedral is truly a sight to behold. Like many of the old churches in the city, the cathedral has also been rebuilt since its construction. And the best part? It is just a stone’s throw away from MG Road and Brigade Road and about 2 km from Commercial Street, some of the best shopping places in Bangalore where you can indulge in guilt-free splurging. Many of the visit-worthy churches in the city are located in and around the Cantonment Area as they have a military history attached; Holy Trinity Church is no exception to this. 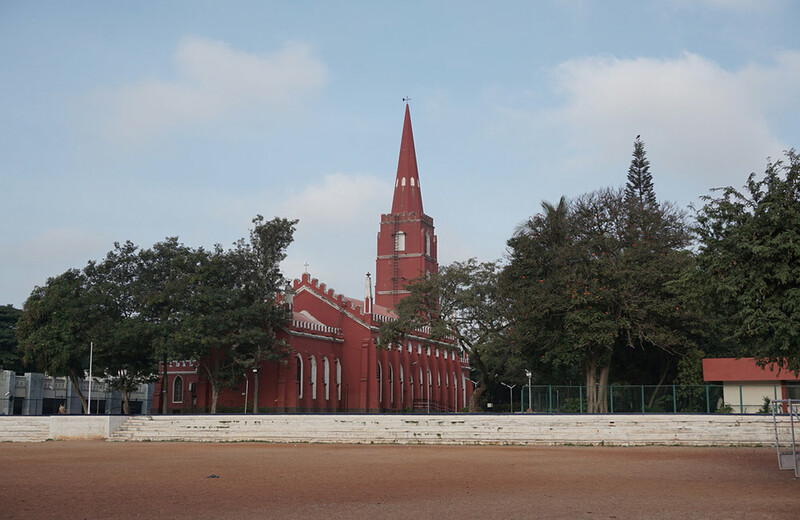 Touted as the largest military church in South India and one of the most significant Protestant churches in Bangalore, it is a major landmark in the city. The church came into existence as the result of a protest against the East India Company policy of ‘One Station, One Church’. Established in 1852, it was once frequented by several high-ranking personalities like Lord Cornwallis and Winston Churchill. Built in the Renaissance style, Holy Trinity Church is an architectural splendor in itself. The ornate marble mural-lined walls are a major draw for tourists at this church. Once you are inside the church, you can spot items, such as the bell, pulpit and baptismal pond that were brought from London. 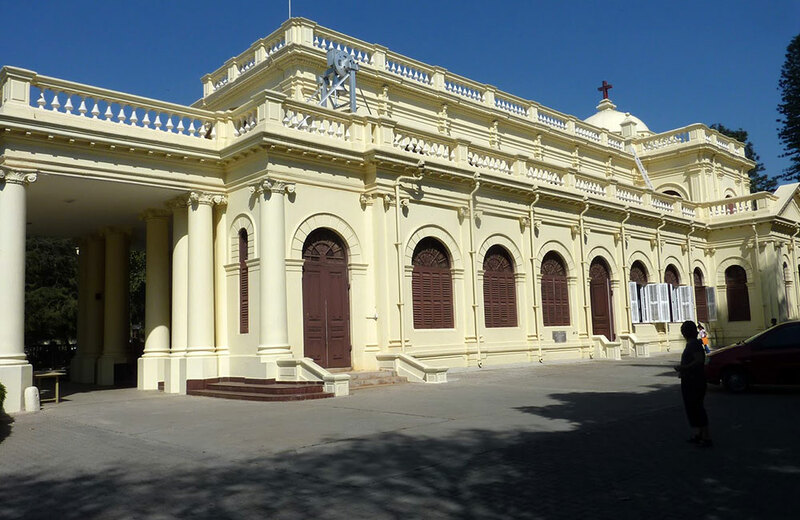 Francis Xavier’s Cathedral, a Roman Catholic Church in Bangalore, is next in the list. It was originally established in 1851, but in 1905, when the cross from the church’s tower fell, the building of a new edifice was considered, which was inaugurated in 1932. 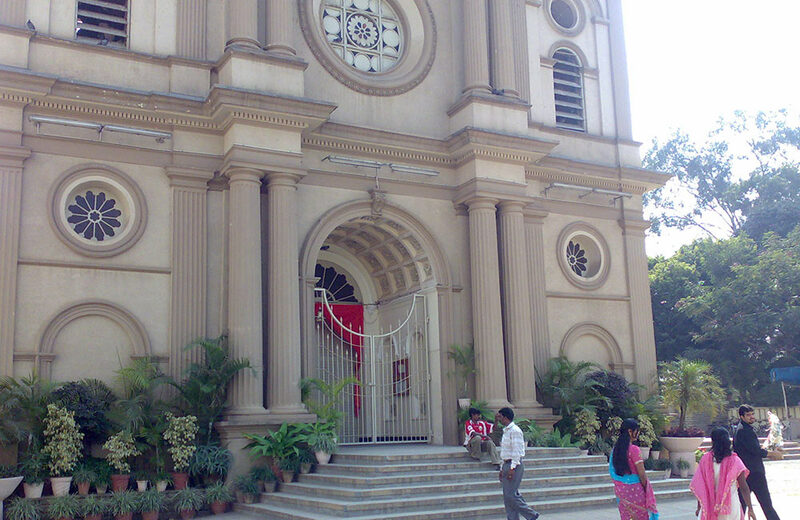 When the diocese of Bangalore was formed in 1940 after branching from the diocese of Mysore, St. Francis Xavier’s Church was selected as its cathedral. The granite church is designed in the shape of a cross with a large dome sitting over the sanctuary. Two other domes in white and blue were added in 2009 during its platinum jubilee celebrations. These domes lend the church a European look and add to its beauty. 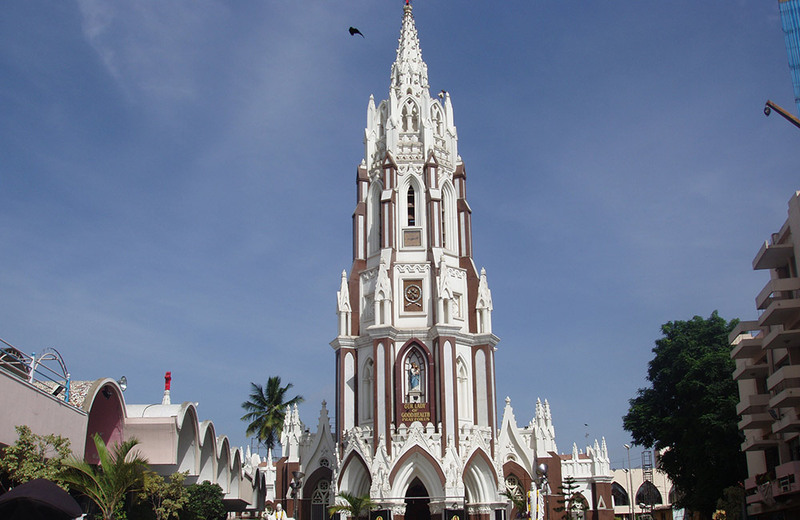 Francis Xavier’s Cathedral becomes the center of huge celebrations during Christmas. Most tourists know Brigade Road as one of the best places to visit in Bangalore for shopping. But not many of them are aware that the commercial zone is also the location of one of the oldest Catholic churches in Bangalore, St. Patrick’s Church. This historical edifice built in 1844 is known for its brilliant architecture; its arched entrance and twelve pillars symbolizing the Apostles of Christ make for an impressive sight. To the right of the main church is a shrine dedicated to St. Anthony. It is believed that prayers at this shrine bear results and the saint relieves devotees out of all miseries and problems. From a humble beginning in the 17th century as a thatched hut to being a must-visit Christian shrine in Bangalore, St Mary’s Basilica has come a really long way. Thanks to its Gothic architectural style, stained glass windows, elaborate motifs, and ornate interiors, the church has become a major attraction apart from an active place of worship. Its significance can be gauged from the fact that it is the first church in Karnataka to be granted the status of a minor basilica. St. Mary’s Feast, which is celebrated in the month of September every year to commemorate the birthday of Mother Mary, witnesses an overwhelming flow of devotees as well as tourists. 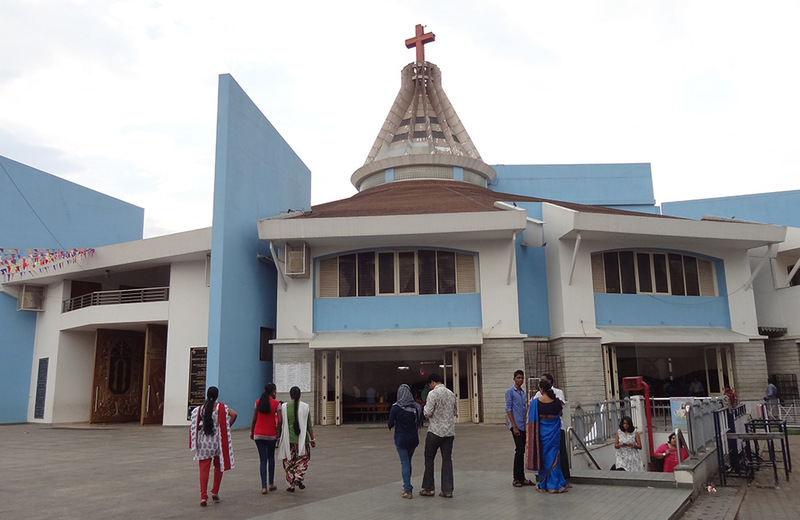 A shining name in the list of churches in Bangalore, Infant Jesus Church is a comparatively new shrine in the city. Built in 1971, the church is dedicated to Infant Jesus of Prague just as its name suggests. A number of miracles have been attributed to this place of worship, which has led to its growing popularity among visitors. Whether you are an ardent devotee or a wanderer exploring the places to visit in and around Bangalore, you must not miss coming here. Its serene ambiance and the central mural, replicating the nativity scene as depicted in the Church of Nativity in Bethlehem, are definitely worth your time. 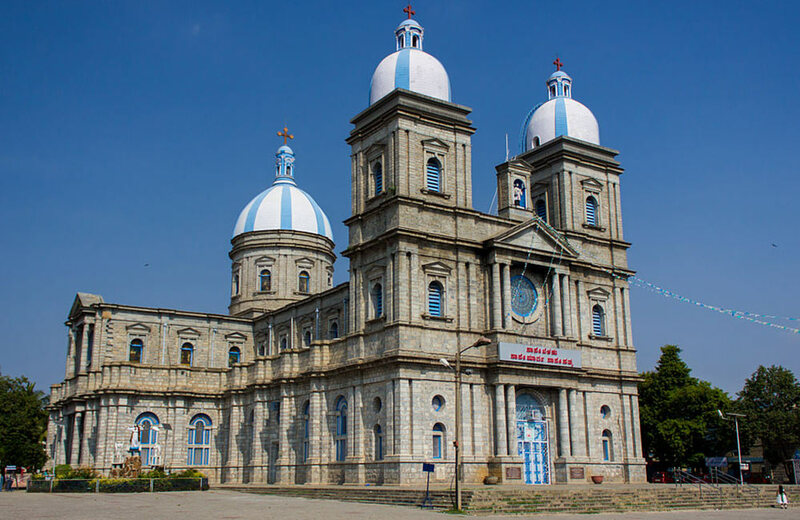 St. Andrews Church may not be the biggest church in Bangalore, but that has never stood in the way of its popularity among devotees and tourists alike. Named after Saint Andrew, the patron saint of Scotland, this Presbyterian Church has a history of more than 150 years. It boasts Gothic architecture and stained glass windows that would remind one of the bygone eras. Located in Shivaji Nagar, one of the areas famous for shopping and street food in Bangalore, the church has remained witness to the changing contours of the city. 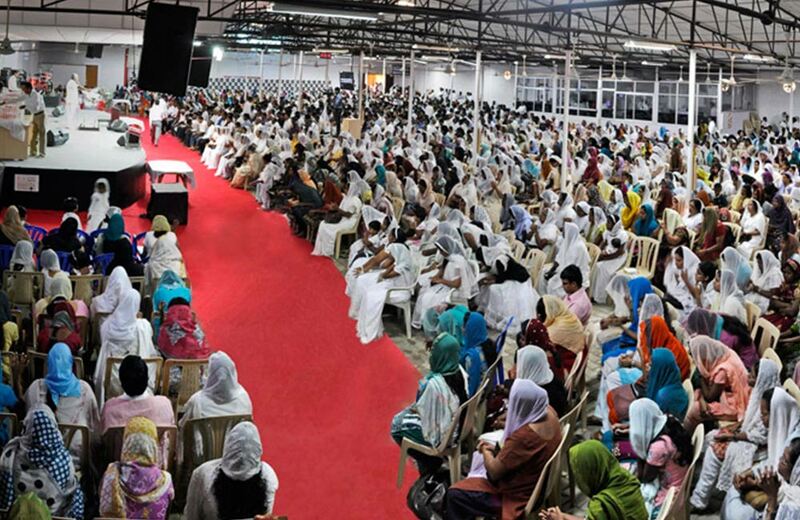 Arguably the best church in Bangalore to learn about Evangelicalism, Bethel AG is an international worship center. Established just over a couple of decades ago, it counts among the largest and the most influential churches in the whole country. It includes two chapels, each with a capacity to seat thousands of people. The Sunday prayer here is attended by believers, both old and young. During Christmas, the church transforms into a scene of festivities, with a huge crowd descending on its grounds. The midnight mass of the church is also a memorable thing to experience. Tracing its origins to early 19th century, East Parade Church is an architecturally stunning building. 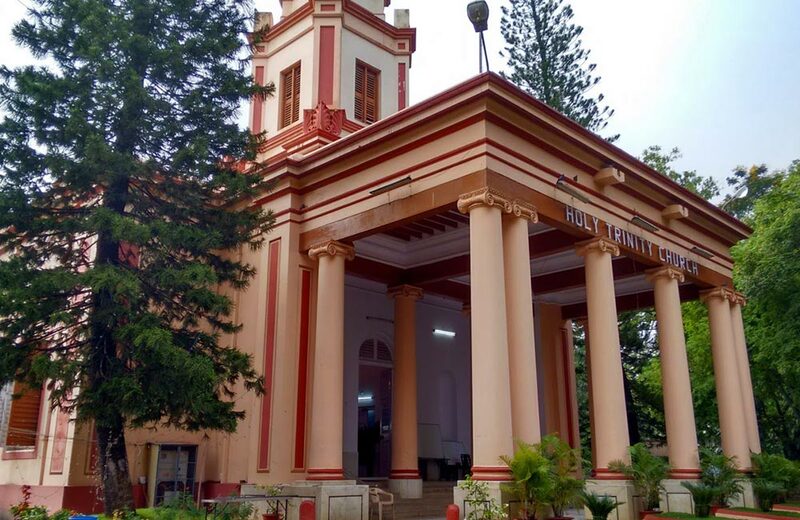 Initially, the church was known as Wesleyan Mission Chapel and Wesleyan Cathedral of Bangalore but eventually, it received the current name due to its location. 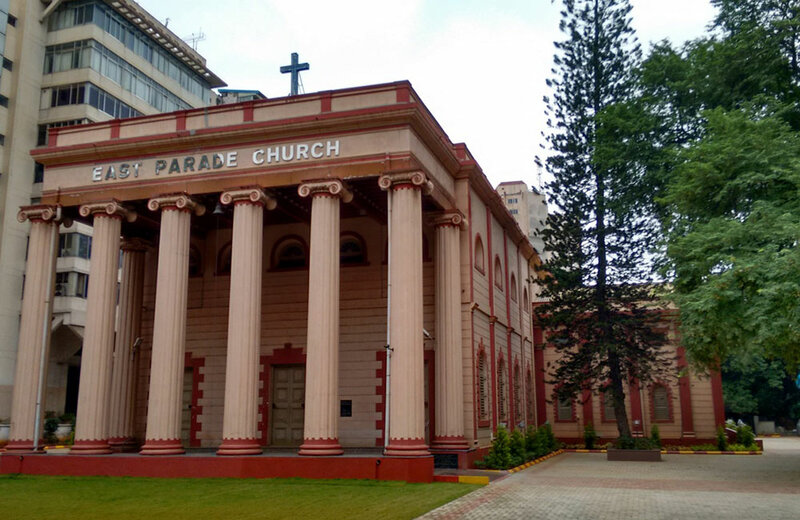 Since the shrine stood on the eastern side of the Parade Grounds of the Madras Sappers regiment (which is MG Road of the present day, by the way), it came to be known as East Parade Church. The current building is located at the spot where the old Wesleyan Mission Chapel once stood. One thing to note about the architecture of the church is that there are no pillars or columns inside, presenting a clear picture of the altar and adding to its overall aesthetic appeal. There’s no doubt that St John’s Church is one of the most striking buildings in Bangalore, and just one look at it will tell you why. The building is a red structure that has an imposing steeple rising above the green surroundings. One of the most significant Protestant churches in the city which traces its origins back to the 1850s, it is dedicated to the Evangelist, St. John. The highlight of this church is its pipe organ, which is one of the largest in the region. You can also spot a war memorial in front of the church, dedicated to those who gave their lives in World War I. 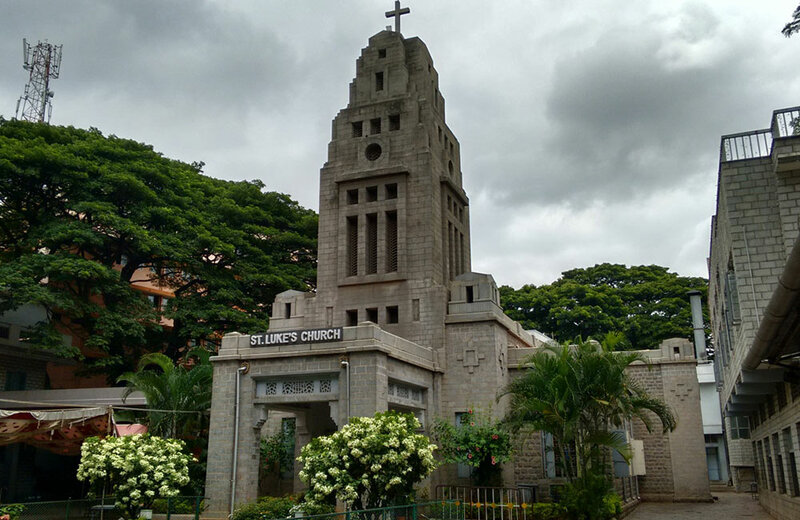 Among the numerous churches in Bangalore, St Luke’s Church is one structure that celebrates a unique blend of Indian and Western architectural styles. Made out of granite, it features a central tower that is about 80 feet in height. Beautifully designed windows with stained glass add to the attractiveness of the edifice. The church derives its name from St. Luke, the Evangelist and one of the four gospel authors. Built in 1935, the building has been standing as a symbol of serenity and architectural beauty in the landscape of Bangalore. Fancy visiting a building that displays the rare combination of French and Gothic styles of architecture? 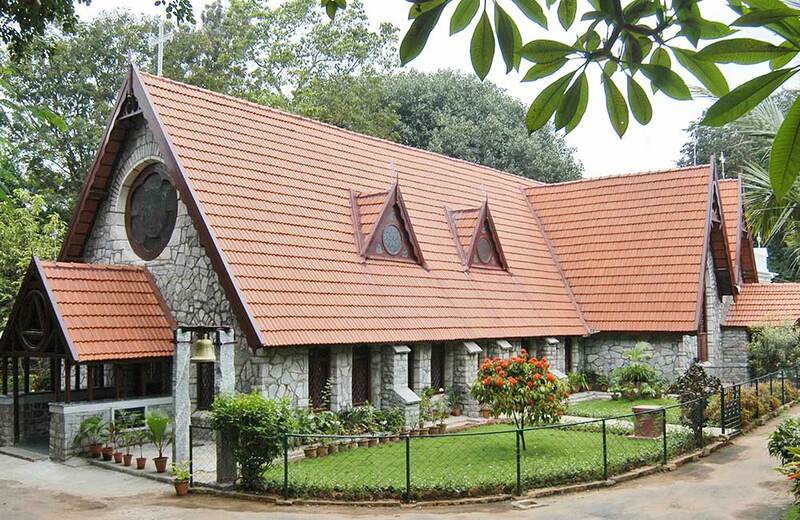 Plan a visit to Sacred Hearts Church, another centuries-old place of worship in Bangalore. Built during the latter half of the 19th century, it features marble interiors and statues that are sculpted to perfection. Solid blocks of granite used in the construction, pillars with Corinthian-style carvings, and side altars typical of the Roman style are also some of its unique features. The mighty bell that you spot here was brought from Italy. Located in one of the busiest areas of the city, i.e. 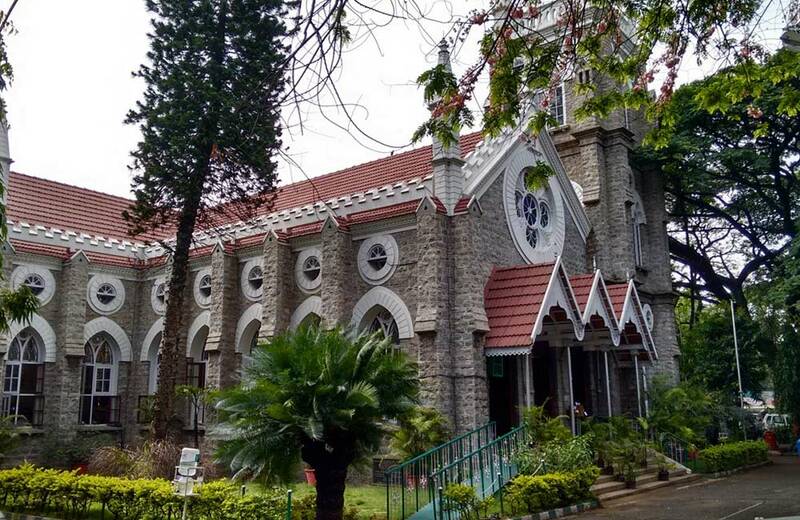 near Cubbon Park, Hudson Memorial Church exudes an old-world charm and boasts a history of over 110 years. Its beauty and grandeur testify to the everlasting appeal of Gothic and Classical styles of architecture used in its construction. Lancet windows with stained glass, pointed arches, ribbed vaulted ceilings, and intricate carvings are some of the key features of this historical building. Guess who painted the stained glass windows you find here? Artists from London! One of the most important Kannada Protestant churches in Bangalore, Hudson Memorial is visited by people from all faiths. Last but never the least, All Saints Church! Also known as the Garden Church of the Garden City, this 150-year old structure is a beauty to behold. It was founded in 1870 by a missionary from London named Rev. St Pettigrew, who was also the founder of Bishop Cottons School. As the name suggests, the church is not dedicated to any particular saint but to all of them out there. As per records, it was established so that low-ranking officials in the British military, the poor in the area, and the European pensioners could come together to worship. A Gothic-style country church set in the middle of a beautiful garden, the place offers you a slice of colonial-era England with its stone walls, dormer windows, low ceilings, and steep cross-gabled roof. Sounds like a post-card worthy picture? It sure is! From age-old monuments to the haunted places in Bangalore, India’s Garden City has something for everyone. If you are looking to enjoy a few moments in nature’s company, waterfalls near Bangalore are the best bet. Those looking to indulge in retail therapy can head to the popular shopping streets and malls. However, when you want to witness the curious mix of history, faith, and architectural grandeur, nothing is better than these churches that dot the cityscape. So, next time you check-in at one of the hotels in Bangalore, make sure that you visit these. Many of these churches, especially the ones in the Cantonment, are located close to each other, so you can even consider taking a ‘Church Walk’ through the area. Sounds interesting, eh? Speaking of religious places in Karnataka, you might want to check out some of the best and most popular churches in Mysore or some incredible temples in Bangalore itself.